That happened to me while having dinner with my sister and our friends Nancy, Jin and Colby. We were enjoying a fantastic Peruvian/Japanese meal at Picca (if you haven’t eaten there, omigodgothereNOWpleaseitssogood), and for whatever reason, I started talking about oranges. I was marveling over how amazing oranges are, that they are so perfectly gifted to us by nature, delivered in perfectly parceled pieces. Every time I peel an orange, I am actively thinking about what an incredible thing it is. Oranges are amazing, right? I went on and on and on as we sat there in that restaurant, shareable plates of uni and scallops scattered on the table, pisco sour cocktails in hand. Looking at the faces around the table, I got this sinking feeling that I was alone on this. Everyone was staring at me as if I’d walked into the room naked! My voice trailed off, and I took an awkward sip of my drink. “Oranges…amazing…no?” Heh. LOL. I sounded like a crazy person. I had to genuinely explain to them I hadn’t dropped acid before I came to dinner, that these are the things that I actually think about on a regular basis. I started to wonder if maybe it would’ve been better if they thought I was high. Instead, they decided I was completely nuts. This was like two years ago, and still, they never let me hear the end of it! 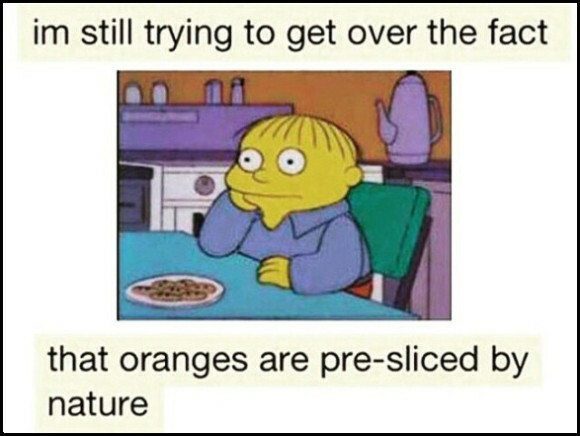 But then yesterday my buddy Joshua texted me this meme of Ralph from The Simpsons, pondering the awesomeness of oranges too. And now I don’t feel so alone. It’s not just me after all!